My husband is blessed to have a good job, especially in this downturn in the job market. I just wish that we did not have the unnecessary debts that cause such stress on our family. Having a good job to cover our bills and groceries means he has to travel for work. He doesn't mind. He loves traveling. And because he works so hard, I do hope he enjoys most of the places he gets to work in. I remember after one commute he tells me that he will need a couple business suits for work. Que? I was so very excited. I've always wanted to dress up my man! 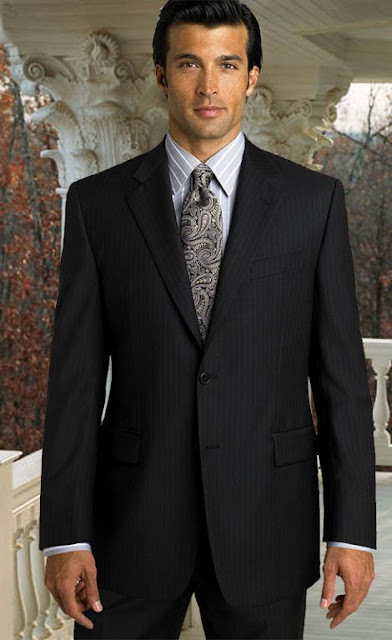 There is nothing like seeing a well-dressed man going about his business with confidence! I remember when I first got engaged, I went about learning to tie a tie because I thought, I'd have to help my husband every so often. No. He never wore suits. It was the American thing to wear jeans and tee or shirt everywhere. Oy! But with this commute, it was necessary for him to be in suits :) Did I mention I was excited? I went shopping for shirts, socks and ties that I thought would look great on him! He, of course, had to get the pants. After all, they must be the right fit! It was quite the experience and I did find really good colors and good length matches for him. Since I am now aware of Groupon, I've decided to share this website with him, so he could get even more for his money by using the coupons when he goes out to shop, treat himself, get a massage or enjoy the American cuisine that he has missed so much while being away. These great deals are always coming and going, so if you see a good deal, get on it before it changes. There are so many ways to save money with Groupon Goods! You can find great deals on anything you are needing. And the coupons are tailored to where you reside. With Groupon, you can save on more than just events and experiences! Groupon is a great money-saving resource that allows you to find deals on goods and services from your favorite retailers. I love to save money whenever I can and Groupon Goods makes it super easy to do so. I love that searching for coupons is easy and saves me money with the click of a button. And of course NO membership or other fees. That’s right – it’s totally FREE!!!! How can Groupon Goods Save you money? What area would you shop first or most on Groupon? Thanks for visiting with me. Please share a like or follow on Facebook - Twitter - Pinterest or Instagram. If you do follow, let me know so I can reciprocate.